I've read a lot about dental implants and I'm about to have two placed, but what is it actually like to go through the surgery? Can you give me a “step by step” of what to expect? The final restoration of a dental implant. A natural-looking crown is attached to a connecting piece or “abutment” to form a complete tooth-replacement system. Many people are surprised at how relatively easy dental implant surgery is because they let their imaginations get the better of them before they go through the actual procedure. The reality is that most patients experience no pain during the surgery and very little discomfort afterward. Let's back up and start with the basics to increase your understanding and allay any apprehension. 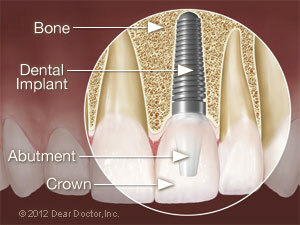 Dental implants are replacements for the root parts of teeth. They are placed directly into the jawbone. Natural-looking crowns or dentures are attached to the implants to form the tooth-replacement system, which can be a simple crown or a larger bridge. This can happen immediately or several weeks later, depending on your case. Most modern dental implant systems are made of commercially pure titanium or titanium alloys. This metal has a unique ability to fuse directly to bone through a process known as osseo-integration (“osseo” – bone; “integration” – fusion with). It is extremely important, then, for the implant to be engineered in a way that will maximize its surface area-to-bone contact. This is achieved in two ways: by giving the implant the spiraling shape of a screw, with multiple threads, and by microscopically roughening or altering its surface. 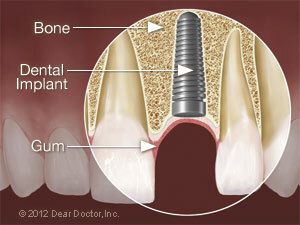 This allows the implant to be precision fitted and stable, both of which are necessary to initiate healing and fusion. The implant's screw shape seems to be what gives some people pause; having a screw put into bone sounds like it would be painful; the reality is quite the contrary. This illustration represents an ideal implant site. 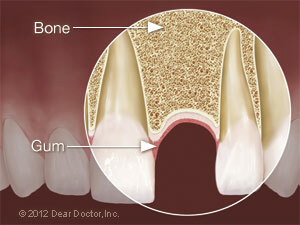 There is a proper amount of bone tissue to support the gums and provide a natural-looking result. Implant placement surgery is actually a relatively minor procedure, especially if appropriate pre-planning has been done ahead of time. This generally takes the form of radiographic (x-ray) examination, frequently CT scanning, and often the use of a precision surgical guide. This allows a determination of your occlusion (bite), where the new replacement teeth will be placed within it, exactly where the implants will be placed in the bone to support the teeth, and the bone quantity and quality into which they will be inserted. So you can see nothing is left to chance. If you have any anxiety about the surgery, tell your dentist ahead of time. While almost all implants are placed using local anesthesia (numbing of the area with small shots), mild apprehension can be relieved with sedative or anti-anxiety pre-medication given either orally or intravenously (“intra” – within; “venous” – vein). Following the administration of local anesthesia, your dentist will test the area before starting to ensure that it is numb and that you will not feel anything. One of the most important parts of the surgical procedure is what is referred to as “site preparation.” A relatively small channel, a hole actually, is prepared in the bone. This is referred to as an osteotomy (“osteo” – bone; “otomy” – to cut or separate). Small incisions into the gum tissue are used to access the bone thereby creating small “flaps” as they are called (like flaps on an envelope), to allow visualization of the bone's shape and location. If a surgical template or guide has been made, it will be placed in the mouth, and the osteotomy sites prepared through it to ensure accurate positioning of the implants. A drilling sequence is used that progressively increases the size of the site until it mirrors the implant shape exactly to ensure the necessary precision fit. Sometimes implants can be placed without flaps or incisions if there is a guarantee that the osteotomies can be made in exactly the right place, which requires good bone quality and very accurate surgical guides. The drilling procedure is critical to implant success, to ensure the implants “take” by fusing to the bone. Living bone tissue requires very careful handling, using gentle pressure and generous water-cooling so that it is not damaged by overheating, which can lead to bone loss where it is needed most — in direct contact with the implant surfaces. Mild vibration is associated with the bone preparation process and may be noticeable but is invariably well tolerated. A properly placed dental implant. Notice its position relative to the adjacent teeth, and to the surrounding bone and gum tissues. The next step is to place the implants straight into the sites so that the healing process can begin. Dental implants are sterile and it is critically important that their surfaces are untouched. The implants go from their sterile packaging into the osteotomy sites. Radiographs (x-ray pictures) are generally taken during or after the procedure to verify correct implant positioning. The surgical procedure ends with closure of the gum flap tissues. Often, sutures (stitches) are used that are self-absorbing and therefore do not need to be removed. Other types that are not self-absorbing need to be removed in a week or two. Because of the nature of the surgery, and with the gentle tissue management described above, discomfort is minimal and healing is very predictable (95 - 97% success rates). However, every situation is different and your dentist should give you insight as to what to expect in your situation. Mild non-steroidal anti-inflammatory medication of the aspirin or ibuprofen family, generally of prescription strength, is usually all that is necessary to relieve any discomfort and swelling in the first two or three days. Some practitioners prefer opioid type prescription medication (codeine or hydrocodone), or a combination of the two types. Antibiotics may also be prescribed to ensure healing, in addition to anti-bacterial mouthrinses such as those containing chlorhexidine, during the time that the gum tissues are healing. All post-operative healing and nutritional recommendations will be provided by your dentist. The surgical phase of successful implant tooth-replacement, then, is generally easier than most people imagine. It is one event in a very well-thought-out, organized process — in fact it is relatively — uneventful.